The new NanaNubs™ Banana Massaging Toothbrush from Nûby™ is specially designed to instill positive and important dental hygiene for your baby from the beginning. 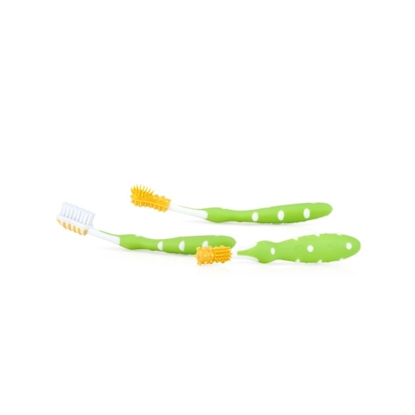 Nûby's NanaNubs™ Banana Massaging Toothbrush is made of extra soft silicone with your baby's comfort in mind. 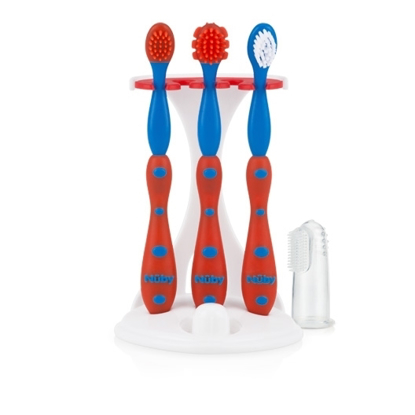 Massaging bristles clean and soothe new teeth and tender gums. Exactly what baby’s gums needed! I’ve looked and bought several dozen items to soothe my teething babies gums. Not one thing did the trick until I bought this nananub! Originally I thought it would be adorable to see her gnawing on it, little did I know the little handles and bumps on the end was exactly what she wanted for her gummies! She gnaws on this nananub constantly! She loves it so much I bought another! The only downside is it attracts fuzz/lint easily, it needs like a case or sack to keep it clean. Other colors would be nice also to distinguish between them, as if one is dirty or clean in rotation. Just a suggestion! Highly recommend these for babies with teething gums! Plus it’s adorable to see baby chewing on the mini banana! !